Being at sea aboard the elegant mid-size ships of Oceania is a wonderful world of personalized service and amenities. When that service is matched up with award-winning itineraries – an exceptional value is created. When our clients return from an Oceania cruise, they report that they make friends easily; they enjoy gourmet cuisine in a wide variety of (always-complimentary) open-seating restaurants, and experience a warm on-board ambiance that echoes that of a private country club. 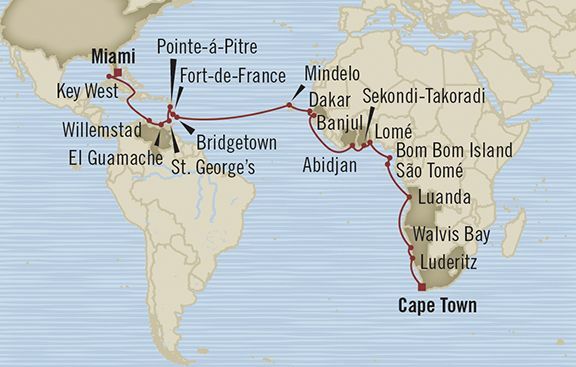 That is why I recommend sailing from Capetown to Miami aboard the Oceania Insignia over the 2015 holiday season. Fly to South Africa and let the Insignia bring you home. Your trip begins with a flight to Capetown, South Africa. Oceania has an excellent three night deluxe safari to start you off. Then, embrace the explorer within you as you embark on this magnificent crossing of the Atlantic Ocean. Seals, flamingos, ostriches and endangered African penguins greet you in Luderitz. Taste, see and hear the rich blend of two cultures in Luanda, the world’s third most populous Portuguese-speaking city. Stroll to the top of Broad Street in Bridgetown, the capital of Barbados, to see the Parliament Building and the monuments on National Heroes Square. Key West has drawn poets, artists and playwrights for centuries. Rent a bicycle or plan a walk along its palm-lined streets, through the unusual Key West Cemetery and past the gingerbread mansions, and make a visit to Ernest Hemingway’s home. For our local clients in South Florida, this cruise is a shopper’s delight. Go ahead and bring home that beautiful piece of artwork from Barbados or some pottery from Bom Bom Island. The Travel Gallery will dispatch our chauffeur-service to meet you at the Port of Miami and drive you and your purchases back to your home in the Jupiter/Hobe Sound area. There are plenty of unique ports of call for you to explore for the first time. An American Contract Bridge League accredited master instructor will be on board to conduct classes and tournaments. And there is plenty more to do on the recently refurbished Insignia. She features four unique, open-seating restaurants, a world-class fitness center and spa, eight lounges and bars, a casino and 342 lavish suites and luxurious staterooms, nearly 70% of which feature private verandas. With just 684 guests to pamper, Oceania's 400 professionally trained European staff ensure you will wait for nothing.